Here's an easy way to make your own buns quickly - and you can easily customize these buns to make them even better - for your summer hamburgers (or any other sandwich). Here's the basic recipe, along with some easy options. Seeds: sesame or any seeds you like. The egg wash will help the seeds adhere to the buns. Pour the water and the yeast into your EZ DOH container. Mix to dissolve the yeast. Let it rest for one minute. Add 1 cup of flour and use the hand crank for 20 seconds to do an initial mixing, then add in all of the remaining ingredients and start mixing/kneading by turning the hand crank. The dough will want to stick to the dough hook, so take your time and reverse the turn direction as needed, and mix/knead everything for about 4 minutes. Empty the dough from the container onto a lightly floured surface, and knead the dough by hand a few times to prepare it for cutting into pieces. Divide the dough as you like (this recipe makes anywhere from 8-12 hamburger rolls depending on size). We divided our dough into 10 pieces that each weighed about 3 1/4 ounces. Weighing each piece enables you to keep the sizes uniform so each bun is fully cooked in the same amount of time. Roll each piece of dough into your desired shape (flour on your hands will keep the dough from sticking) and then place each piece on a greased baking sheet, or use parchment paper. 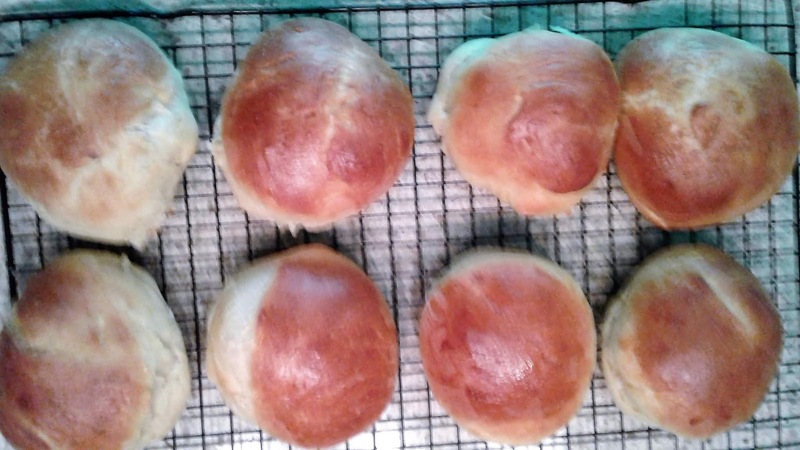 Cover the buns with a clean tea towel for 15 minutes to allow them to rise. Pre-heat your oven to 425 degrees. After the buns have risen for 15 minutes, brush the top of each roll with the egg wash (see below for more egg wash information), and then add any seed toppings that you like. Then place the baking sheet into the oven and bake for approximately 15 minutes. When they are golden brown (they are "officially" done when they reach an internal temperature of 190 degrees), remove from oven and place on a cooling rack for a few minutes. One whole egg with 1 TBSP milk will enhance the color and shine of each top. One whole egg with 1 TBSP water will not only increase the color and shine, but will soften the top. One egg white (no yolk) with 1 TBSP water will produce a firmer crust and extra shine. Please feel free to contact us at info@ezdoh.com with your questions or comments.